I’ve been meaning to write this Creative Business Resource Guide for a while now. 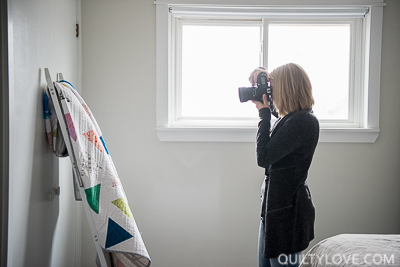 I started quilting as a hobby and it quickly escalated to a business. 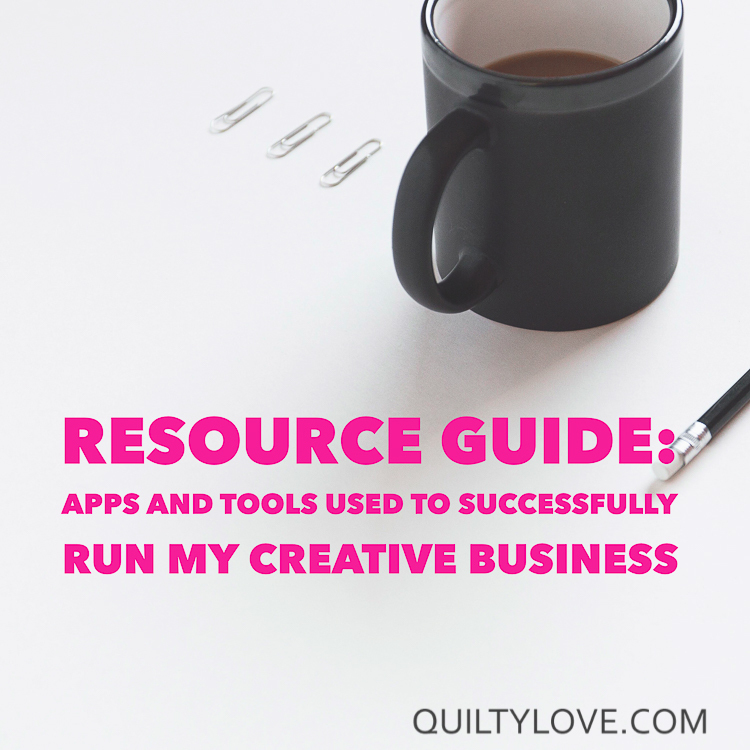 Here are the apps, tools and software that help me smoothly run my Creative Quilting Business. I get questions about these tools and services often. So here is a complete resource guide of the tools I use, love and recommend. I’ve been on WordPress for about 7-8 years and love it. I highly recommend the self hosted option over the free option. The easiest way to get started is to set it up through the hosting site. So first choose a hosting site and set up WordPress through their prompts. WordPress recommends Bluehost, Siteground or Dreamhost. (I currently use Dreamhost) WordPress itself is free but you will pay for a hosting site and a theme. I recently switched my WordPress theme over to Genesis + Foodiepro and I love it! I do highly recommend investing in a good theme. A good theme means you can skip the coding and easily customize your site yourself. I was super impressed with how easy the Genesis framework is to use. My main selling site is with Shopify. And I loooove it! I switched to Shopify in May of 2017 after doing the free trial and haven’t regretted it for a second. I sell both digital download patterns and paper patterns there. You can sell other items such as handmade quilts, tees or other branded products. I wrote all about my love of Shopify and why I made the switch here. It’s true what they say… having an e-mail list is so valuable! Social media is always changing so having a direct way to connect and speak to your audience is sooo important! I started out with Mailchimp because they have a free option. I’ve looked into other providers since I’ve started paying for it but so far Mailchimp is getting the job done. It’s not super intuitive especially as you get into different segments and groups of people on your list so it’s required a lot of google searches. It’s a great place to start though and you can always easily change providers down the road and take your list with you. I just signed up for Leadpages and am currently testing it out. (They have a free trial.) Already the results are surprising! It will be interesting to see just how much it grows my e-mail list and how that effects future stats and sales. I use both Adobe InDesign and Adobe Illustrator to write and draw the graphics for my quilt patterns. Adobe is currently only available as a subscription service which in my opinion is a major bummer. I use the Adobe creative cloud enough to justify the steep cost but it’s a little hard to stomach if you are just starting out. Quilt patterns are sketched out and designed in Adobe Illustrator. When I want to design something new I start drawing in Illustrator. The patterns are then written in Adobe InDesign and the graphics I draw in Illustrator are added to the InDesign document. I started my first few patterns in Mac Pages! It has plenty of basic drawing commands for drawing graphics and as a bonus a lot of the commands will carry over to Adobe programs so it’s a great place to start. I’ve never used a quilt design software such as EQ8. I know others who love it and others who say the learning curve is steep. Adobe Lightroom is also part of the Adobe Creative Cloud. I do all photo editing in Lightroom. There is a learning curve with Lightroom but I couldn’t live without it now. Obviously as a photographer it’s a necessity for me. Tailwind is a scheduling app for Pinterest. Tailwind has really helped up my Pinterest game! Majority of my website traffic comes from Pinterest so it’s been an important part of my business. I wrote about Pinterest here. You can sit down once every couple of weeks and schedule out weeks or even months worth of pins so you are staying active on Pinterest. I use Tailwind to schedule out all of my blog content. Another pretty awesome part of Tailwind is Tribes! Tribes has been an amazing way to spread the reach of my pins. 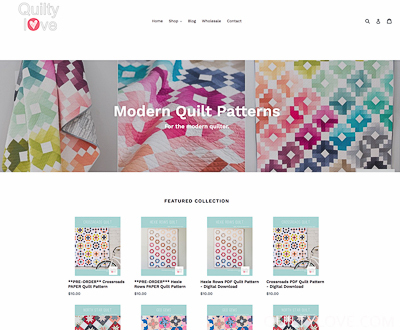 Once you get on Tailwind, request to join my tribe: Modern Quilt Bloggers. Tailwind has a free trial so you can go see what it’s all about. I think it’s relatively affordable considering what it’s capable of. Track Income: I pretty much just use an excel spreadsheet. You can have that spreadsheet for free on this blog post. I have used Quickbooks in the past and really liked it. I do currently use 17hats to manage the finances for both of my businesses but it’s certainly not a necessity. I use the excel spreadsheet to track income and then transfer the info into 17hats. 17hats can connect automatically to your bank to track and record your Income and expenses. At tax time I provide my accountant with profit and loss statements from 17hats. Track Expenses: Expenses are easy to track because I have a separate business checking account. Basically every debit from that account is a business expense. I do use 17hats to record all expenses. Learn more about paying yourself and all of the different accounts I recommend in this blog post. I rely heavily on Google calendar and a good old fashioned planner. I love the planners that have daily checklists. My current planner is the Rifle Paper co planner. Checklists work well for me. Using a checklist planner really keeps me on track. Any new ideas that come up get penciled into the calendar usually in future dates. Dropbox: Couldn’t live without dropbox! I think I still use the free version but it’s how I get images from my phone to my computer and vice versa. To be honest my husband is my cloud techy so he hooks me up with all of this stuff. I do have a wholesale account but it can be tough to meet the minimum spends sometimes. Fabric.com: Mostly I’m buying my fabric from fabric.com. I know they had a bad rap for a while but I do think they have improved their services greatly. Most of my yardage is from them. They recently started a new program for small business owners. Fat Quarter Shop: I usually buy my bolts of Kona from The Fat Quarter Shop. I’ll also occasionally pick up bundles from them. Instagram: Yep, I grab bundles off of Instagram quite often when shop owners post about it. I also love fabricbubb.com for bundles (especially solid bundles!). I buy batting by the 40 yard roll from either Joann’s or Amazon. I use this Warm and White roll. I don’t buy a lot of fabric these days. I will request it from manufacturers from time to time. But mostly, I only buy what I need because as this business generates more income I’d rather pay myself than buy fabric that will sit on my shelves. Paper patterns are formatted in Adobe and printed through magcloud.com. Magcloud has worked well for me since I don’t buy large quantities. You can place small orders with them and their quality is great. I like a full color booklet style pattern so they are little more expensive to print but worth it to me. I use their 5.25in x 8.25in digest product. I order the clear bags for the paper patterns from clearbags.com. I use these ones. Mailing envelopes: I use these envelopes to mail paper patterns. They are the perfect size and can still go first class. My main computer is a 27in iMac. Gosh, I love this thing! The humongous screen is a luxury for sure but my entire livelihood relies on this machine. I used to use PC and switched to Mac about 7-8 years ago. Love my macs for this creative field of business. They just work. I’ve been using these WD My Book Duo hard drives for years. I think I’m on my third one. I like these hard drives because they are compatible with my Macs (I did have to reformat it first) and they have the option of being a RAID system which means it stores a duplicate of the info on it. No worries of a bad hard drive. I use the the Apple Time Capsule to automatically back up my computer. My main camera is a Nikon D810. As both a blogger and photographer, this camera gets a ton of use. It’s overkill for just blog photos though. If you are looking for a DSLR to start with I would recommend checking out something like a Nikon D5600 or Nikon D3400. The Canon rebel series are also popular cameras for the Canon users. If you have outgrown the consumer models and are ready for a full frame camera you might like something like the Nikon D750. I think that will be my next camera purchase. On the canon side an entry level full frame is the Canon EOS 6D. I have two lenses that I use exclusively for my blog and product photos. They are the Nikkon 50mm 1.8 lens and the Nikon 35mm 1.4 lens. Every blogger needs a 50mm lens! Ok, maybe need is not the right word but seriously this lens gives you the most bang for your buck and is so so versatile for blog and product photos. It’s affordable, it works awesome in low light indoor settings and you will love it. Just make sure you grab the right one for your camera. Not all lenses work on all cameras. I recently purchased the Nikon 35mm 1.4 lens and honestly this is the one that pretty much lives on my camera. There is a cheaper 1.8 option for this lens also. It’s a tough choice but if I was to recommend one lens to you it would probably be the 50mm first and the 35mm second. I always have white poster foam boards like these on hand as reflectors. I buy them from the big box store. I don’t want to overlook this info because seriously, it’s so important! I’ve learned so much over the years and can contribute much of my business success to the educational resources available online. Creative Live: If you haven’t heard of Creative Live, you should definitely go check them out! I’ve watched hours and hours (and hours) of education through creative live. I owe so much to them as I’ve learned everything from photography to business to finances to travel hacking through them. Anything by Tara Gentile – she is one of my favorite instructors and her content is geared towards Creative maker type businesses. Anything by Megan Auman – Another one of my favorite business instructors. She has some really great wholesale classes. 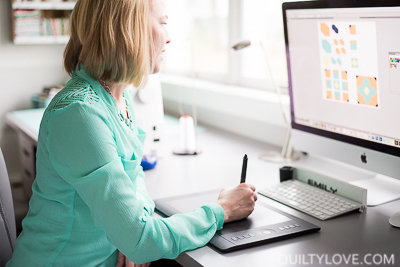 All of April Bowles-Olin’s courses – I learned how to create digital products through her courses. So much great info! There are too many to list but my favorite channels are their Craft and Maker channel and their Money and Life channel. I haven’t paid for many online courses but I’m constantly watching the free webinars for them ;) I’m not opposed to purchasing a really great course and there are a few I’m interested in. Making Sense of Affiliate Marketing: This is a course I did pay for and recommend. It’s affordable and has some great info. I would say it’s geared more towards the beginner blogger interested in affiliate marketing. I don’t consider myself a beginner in affiliate marketing but a funny thing happened when I took this course. Since I paid for it, I actually implemented the things it recommended! I knew they were things I should be doing but going through the course prompted me to FINALLY DO THEM. So basically this course paid for itself before I even finished it. I’ll update this section as I take more online courses. I hope you found this helpful. Leave me a comment letting me know the tools and apps you find helpful in running your business! 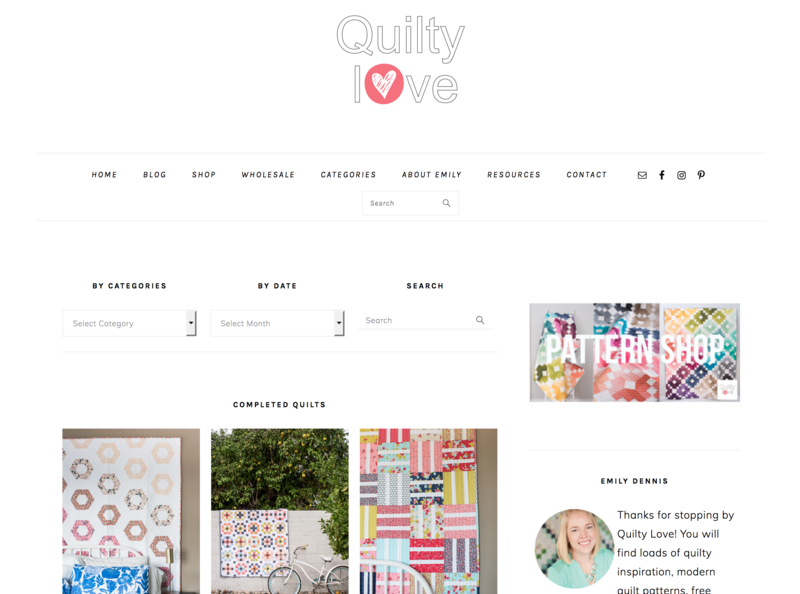 Join other business minded makers on the Quilty Love e-mail list. What a wonderful and helpful blog post! Thank you for pulling all of your resources into one post. I currently use Corel Draw for my patterns (it is like the ugly step sister to Adobe, but it does everything I need including vector drawings and is so much less expense than Adobe. I hate how adobe switched to a subscription based service). Great! Thanks! Yes, Tara and Megan are full of great info! SO helpful!!!!! Thank you so much for all this great information. How do you order your bolts of Kona from Fat Quarter Shop? Do you just enter the quantity and they send you a bolt? Or do I need to email them directly to place a bolt order? This is great! You have been very thorough and very generous with your information. Thank you! How am I just now finding these resources?! Thank you, thank you, thank you for putting this golden info out there! I will be reading all the other creative business posts you have throughout the day today.